Celebration of Bar Mitzvah at the Western Wall in Jerusalem. In Judaism, the term Bar Mitzvah (Hebrew: בר מצוה) refers to a boy's coming-of-age ceremony held upon (or shortly after) his thirteenth birthday. At this age, a boy is said to become Bar Mitzvah (Hebrew: בר מצוה, literally meaning "one to whom the commandments apply"). Often this term is loosely translated as "son of the commandment." According to Jewish law, when Jewish children reach the age of maturity (12 years for girls, 13 years for boys) they become responsible for their actions and thus a special ceremony is held for each gender to recognize their adulthood. Before this age, the responsibility of the child to follow Jewish law and tradition lies with the parents. After this age, the children are privileged to participate in all areas of Jewish community life and bear their own responsibility for Jewish ritual law, tradition, and ethics. It is common in Jewish culture to celebrate the coming-of-age transition. In popular usage, the terms "Bar Mitzvah" and "Bat Mitzvah" are often mistakenly used to refer to the celebration itself; however the term actually refers to the boy or girl. The event is often misunderstood to confer the status of a Jewish adult, but in fact it is merely a celebration of the adulthood that came about automatically by virtue of age. The ceremony itself does not change the status of the celebrant nor does it imbue any additional rights or responsibilities beyond those which were automatically imbued on a boy's thirteenth (or girl's twelfth) birthday. The term Bar Mitzvah (בר מצוה) is typically translated as "son of the commandment," and Bat Mitzvah (בת מצוה) as "daughter of the commandment." In Biblical Hebrew, however, the word "bar" or "bat" (the latter pronounced "bas" in Ashkenazi Hebrew) could also mean "subject to" (e.g., a particular tax, penalty, or obligation). Therefore, a more accurate translation of the term is actually "subject to commandment." The plural form of the term for people of obligation is B'nai Mitzvah (or B'not Mitzvah if all the people are female). Either on or shortly after his thirteenth birthday, usually during the first Shabbat (Jewish Sabbath), a boy is to recite the blessings for the Torah reading, read from the Torah (five books of Moses) and Haftara (Selections from the books of the Prophets), and give a d'var Torah, a discussion of that week's Torah portion. He may also lead part (or all) of the morning prayer services. Calling the boy to say the Torah blessings is called an aliyah (Hebrew: עֲלִיָּה, from the verb alàh, עָלָה, meaning, "to rise, to ascend; to go up"). Precisely what the Bar Mitzvah should lead during the service varies from one congregation to another, and is not fixed by Jewish law. At this point, the males become entirely culpable and responsible for following Jewish law, provided they have also matured physically to the stage where two pubic hairs have grown. The service is often followed by a celebratory meal with family, friends, and members of the community. 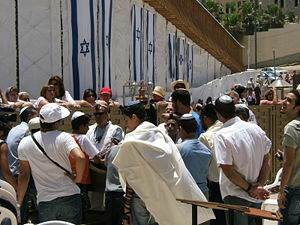 In the modern day, the celebration is sometimes delayed for reasons such as availability of a Shabbat during which no other celebration has been scheduled, or the desire to permit family to travel to the event; however, this does not delay the onset of rights and responsibilities of being a Jewish adult, which come about strictly by virtue of age. Many Jewish boys do not have a Bar Mitzvah celebration, perhaps because the family is too poor, or do not belong to a Synagogue or Shul (a Jewish worship house), or perhaps because they are hidden Jews in the diaspora. In this case, the thirteenth birthday can be considered the child's coming of age. Not having a Bar Mitzvah celebration does not make the child becoming an adult any less of a Jew. Although some people wish to be "Bar Mitzvahed" as an expression of their faith, this has no religious significance. He is not innocent anymore, and is responsible for his own actions (good or bad). Traditionally, the parents of the Bar Mitzvah gave thanks to God that they no longer have to carry the burden of their child's sins. He is eligible to be called to read from the Torah, and to participate in a Minyan (a quorum of ten or more adult (over the age of Bar Mitzvah) male Jews). He is, in theory, legally old enough to be married according to Jewish law. Among religious Jews, it is customary for a man who has reached the age of 83 to celebrate a second Bar Mitzvah, under the logic that a "normal" lifespan is 70 years, so that an 83-year-old can be considered 13 in a second lifetime. This practice is now becoming more common among the less orthodox denominations as well. As with weddings, sweet sixteen parties, and other life events, it is common to give the Bar or Bat Mitzvah celebrant a gift to commemorate the occasion. Traditionally, common gifts included books with religious or educational value, religious items, writing implements, savings bonds (to be used for the child's college education) or gift certificates. In modern times, gifts of cash are becoming more common. Since the Hebrew word for "life" ("chai"), is also the Hebrew number 18, monetary gifts in multiples of 18 dollars (i.e. $36, $180, etc.) are considered to be particularly auspicious and have become very common, for Bar Mitzvahs as well as for other events such as birthdays. Many B'nai Mitzvah also receive their first tallit (prayer shawl) from their parents to be used for the occasion. With an advance notice of six weeks, U.S. citizens can request a White House greeting from the President to commemorate a Bar Mitzvah (among many other life events). The celebratory meals and parties associated with B'nai Mitzvahs have become increasingly elaborate and expensive in recent decades, often rivaling weddings in their extravagance. Many religious leaders and laypeople have expressed concern that these festivities, which they view as excessive, distract from the original purpose of the celebration—the transition from childhood and innocence to adulthood and responsibility. This has given birth to a common modern aphorism: "too much Bar, not enough Mitzvah." This phenomenon may in part result from a desire by Jewish parents to provide a cultural equivalent of the American sweet sixteen party, the Latin American Quinceañera, or the Catholic Confirmation. ↑ The ceremony for girls is called a Bat Mitzvah (Hebrew: בת מצוה, meaning "one to whom the commandments apply"). ↑ MyJewishLearning.net Retrieved September 3, 2007. ↑ Note: "Bar Mitzvahed" is an incorrect use of the term as a participle. The proper way to say it is "to become a Bar Mitzvah". ↑ A Humanistic Bat Mitzvah Retrieved September 3, 2007. ↑ Bar/Bat Mitzvah Program Retrieved September 3, 2007. ↑ Second Bar Mitzvah Retrieved September 3, 2007. ↑ Kirk Douglas Retrieved September 3, 2007. ↑ Bar Mitzvah, Bat Mitzvah and Confirmation Retrieved September 3, 2007. ↑ Gifts Retrieved September 3, 2007. ↑ White House Greeting Retrieved September 3, 2007. This page was last modified on 12 May 2016, at 20:44.